The UK's biggest insurer, Aviva, has abandoned its £17bn ($29.5bn) bid offer for Prudential after failing to win over the board of its rival. Aviva had always made it clear that it would not make a hostile bid in its attempt to secure Prudential. 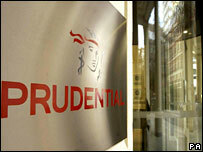 Prudential, the second-biggest UK insurance group, rebuffed last week's takeover approach from Aviva. A takeover would have created the world's fifth-biggest insurance giant in terms of market capitalisation. At close shares in Prudential were down 4.82%, or 34.5p to 681p, while shares in Aviva rose 1.16%, or 9.5p to 831.5p, as shareholders were relieved that it would not increase its offer. "In coming to its decision, the board of Aviva determined that it was not in the best interests of its shareholders to make any material adjustment to its proposed terms," Aviva said in a brief statement. "Aviva made clear that its proposal was dependent on the co-operation of Prudential. As this co-operation has not been forthcoming, Aviva has decided to withdraw its proposal." However, Aviva said it reserved the right to make an offer if Prudential changed its mind on its original proposal, or if a third party moved in and tabled a firm bid for Prudential.